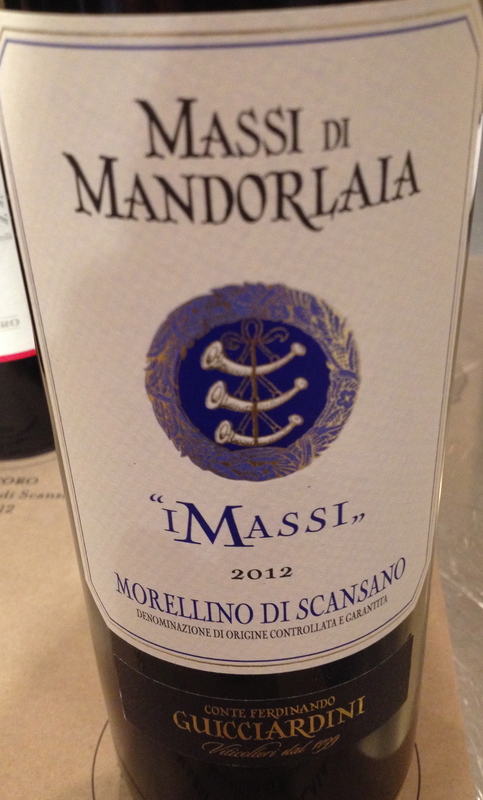 Morellino di Scansano is a wine That does not get the recognition it deserves That. Often overlooked Because of the popularity of other wines from Tuscany, Morellino di Scansano Those like, is based on the Sangiovese grape but is a much better value for the money. 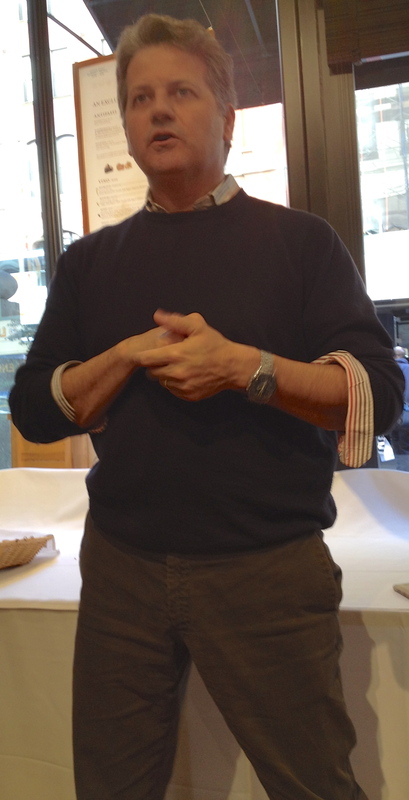 A tasting and lunch of Morellino di Scansano wines was held at Eataly in NYC. Pondini James, director of the Consortium Protection Morellino di Scansano, spoke about the wine. He said That the production areas is the Predominantly hill area around the village of Scansano in the Maremma region of Tuscany between the costal Ombrone and Albegna Rivers. Altitude ranges from just a few meters above sea level near Grosetto to 550 meters in the Collecchio areas. The Morellino di Scansano zone covers Approximately 65,000 hectares of land in the southwest of the province of Grosetto, the southernmost area of ​​Tuscany. There are about 1,500 hectares of vineyards. The reserve must be aged for at least two years, one of Which must be in wooden barrels. Calculated aging period is from January 1 st after the harvest. The regular can be released for sale starting on March 1 st of the year after the harvest. Vinification, aging and bottling must take place Within the production areas. He added That Because of its location the wine is softer and rounder than in other parts of Tuscany. He felt anche That there was a movement in the areas away from the use of international grapes and barrels. 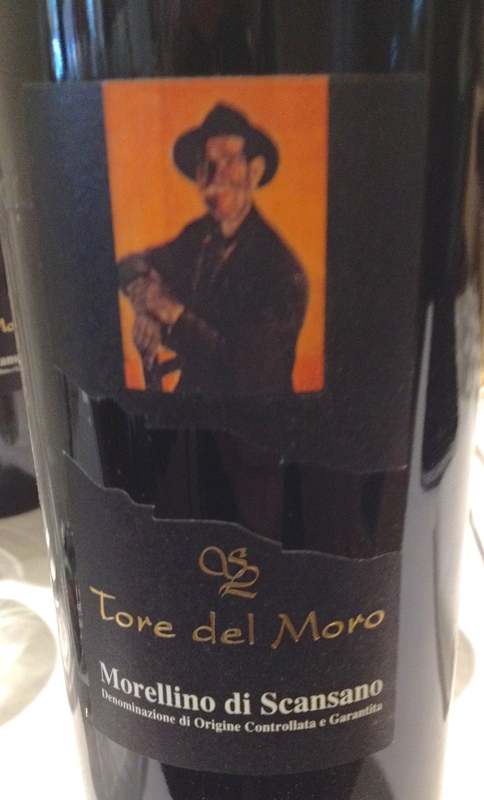 Morellino di Scansano "Torre del Moro" DOCG 2013 Saint Lucia made ​​from 100% Sangiovese. The vineyards are on low hills, facing southwest and the soil is of medium texture, calcareous and stony. Harvest takes place the second or third week of September by hand. Traditional vinification in temperature controlled tanks of limited volume. The grapes are left to macerate for a period of 20 days. Malolatic After fermentation the wine ages in barrels for four months. The wine is bottled at the end of the summer Following the harvest. The wine remains in the bottle for a minimum of 180 days before release. This is a light, fruity, easy to drink wine That goes well with food. 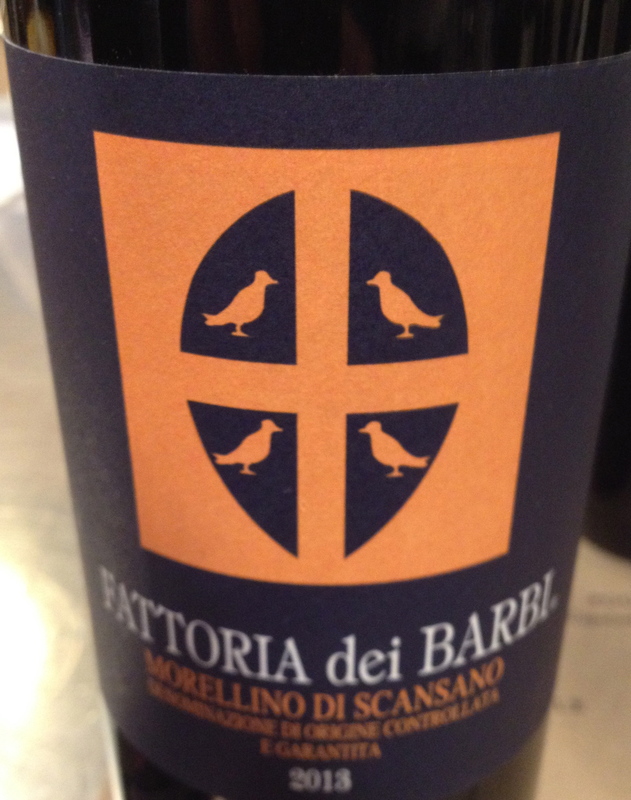 Morellino di Scansano DOCG 2013 Farm Barbi ( Nursery dei Barbi ) made ​​from 85% Sangiovese Grosso and 15% Merlot. This is a 28 hectare property of Which 20 hectares is planted with vines, 16 hectares of Sangiovese and four hectares of Merlot. The estate is on a hill at 250 meters. The soil is mixed with sand stone. Sangiovese from the Maremma, locally known as Morellino, Has softer tannins and acidity levels lower than Sangiovese from other parts of Tuscany. There is s pre-fermentation cold maceration (cold soak), Which Consists of cooling the grapes at a temperature of 60 ° F in an anaerobic environment (under CO2) to protect the must from oxidation. After 48 hours, the temperature is raised and alcoholic fermentation begins, and lasts 12 to 13 days. After racking and Malolactic fermentation, the wine is aged in small and medium oak barrels for six months 15HL to 222L. The wine Has hints of red berries, cherries, a touch of tobacco and good acidity. 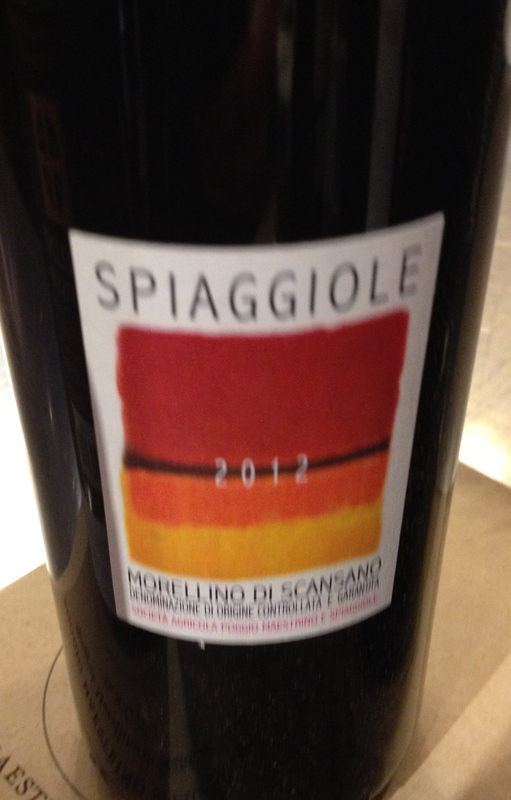 Morellino di Scansano "Spiaggiole" 2012 DOCG Poggio Maestrino made ​​from 100% Sangiovese from the Spiaggiole and Poggio mastrino vineyards. The vines are 10 years old and the exposure is east-west. There are 5,000 plants per hectare. For pruning they use the runner system (cordon) and the soil is medium type of volcanic origin. The wine is fermented in temperature controlled stainless steel tanks. Malolactic fermentation takes place in anche stainless steel tanks. The wine is aged in steel tanks and in the bottle for six months before release. It is fruity with hints of cherry, well balanced and a nice long finish. 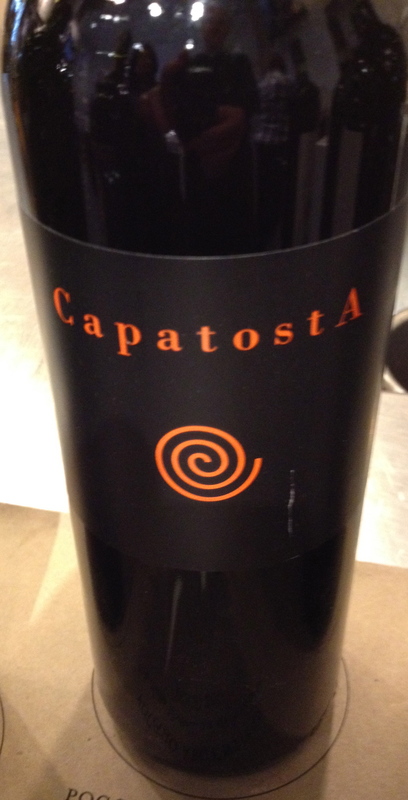 Morellino di Scansano "Capatosta" 2011 DOCG Poggio Argentiera made ​​from 85% Sangiovese, 10% and 5% Ciliegiolo Allicante. 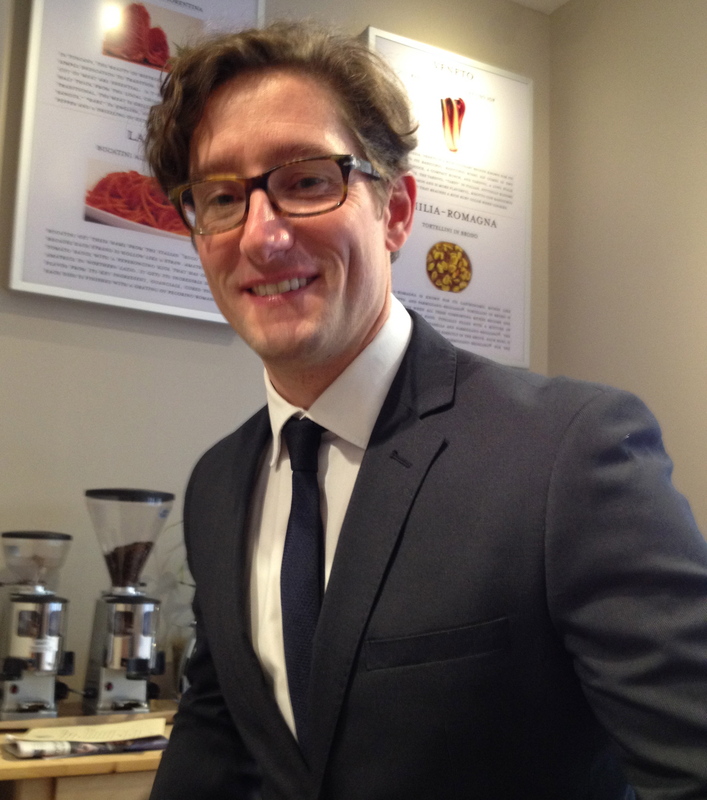 Representing the winery was Giampaolo Paglia, the owner / winemaker. He said the winery was established in 1997 and they Had 6 hectares of old and high quality producing vineyards. They planted new vineyards of local varieties: such as Sangiovese and Alicante. He said he makes wines That have a sense of place, where the terroir is allowed to show itself Unbiased. Starting in 2009 they Began organic farming and follow a very natural and non-intervention approach in the cellar. 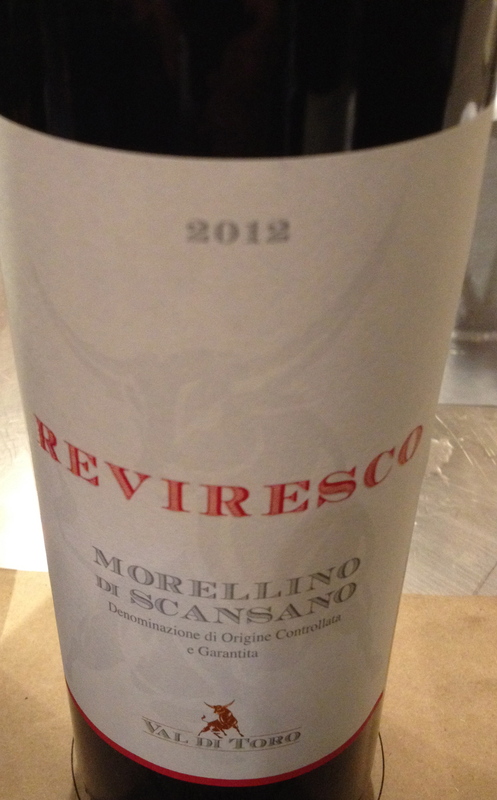 Morellino di Scansano "Reviresco" 2012 DOCG Val di Toro made ​​from 100% Sangiovese grapes are hand harvested and the sorted in mid September. The training system is Guyot and there are 6,000 vines per hectare. After destemming, the must ferments in temperature controlled vats, starting at 18 ° C then gradually rising to 28 ° C toward the end of the fermentation process. During maceration, Which lasts about 20 days, pump over's are the carried out daily and towards the end of the period to short delestage (rack and return). Malolactic is in cement vats, and the wine is Transferred into second passage of French oak barrels, where it remains for about 10 months. Has the wine aromas and flavors of fresh fruit with hints of wild berries and cherries. 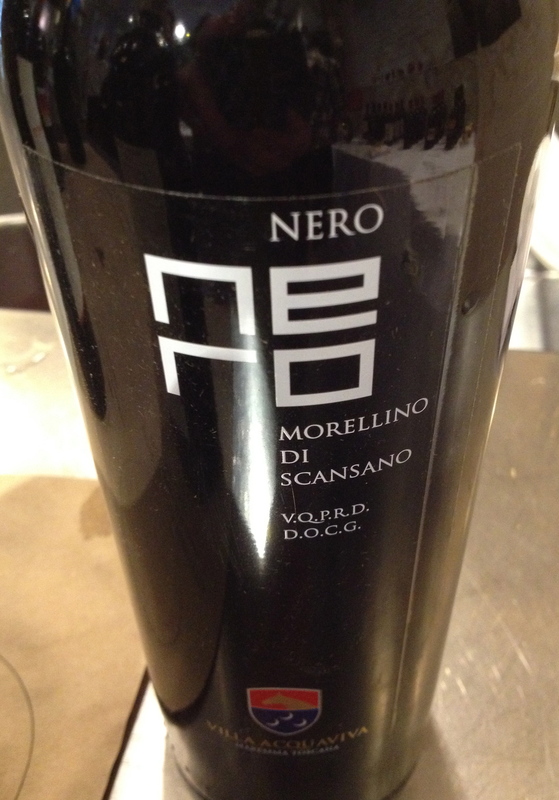 Morellino di Scansano "Black" 2012 DOCG Fattoria Villa Acquavita made ​​from 85% Sangiovese, 15% Malvasia Nera and Alicante. The vines are 330 meters above sea level. Skin contact lasts for at least 10 days. Fermentation takes place for 10 days. The wine is aged in barrels 5.5HL. This is very traditionally made ​​wine with hints of berries, cherries and other red fruits. Morellino di Scansano "The Boulders" 2012 DOCG Conte Ferdinando Guicciardini Boulders Mandorlaia made ​​from 85% Sangiovese and 15% Merlot, Cabernet Sauvignon and Alicante. The wine is fermented in stainless steel with 15 to18 days maceration. The wine is aged for 8 to 10 months in vats and partly in French oak barrels. The wine is aged in bottle for 4 to 6 months before release. This is a well-balanced wine with good fruit, a hint of spice and balsamic with a long finish and pleasant after taste. Anche This was one of my favorites. These wines are a real bargain at $ 20 or less.